Hallébourg – a cluster of approximately 20 homes east of Hearst on Highway 11 – is one of the smallest of the francophone hamlets on Highway 11. I think only Strickland or Harty are smaller. 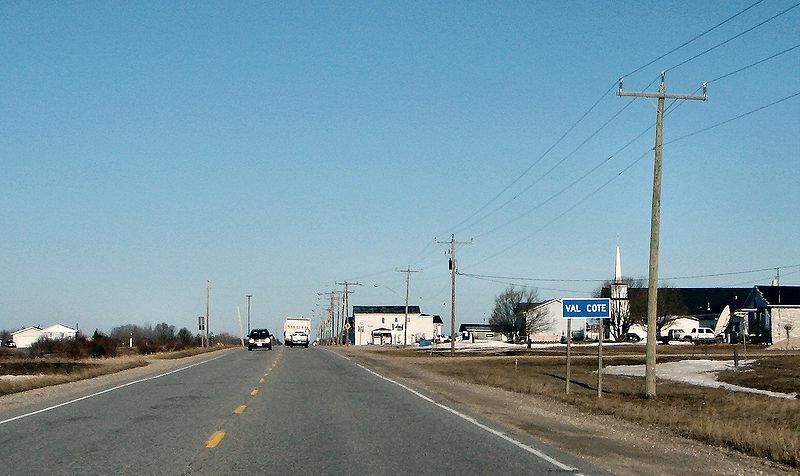 Just east of Hallébourg, Val Coté used to be a tiny farming hamlet, but as farming became less profitable in agriculturally minor areas of Ontario like up here, it soon lost its economic raison d’etre. There are about 15 houses in Val Coté along with an old barn or two, a church, and a tiny caisse. In the church parking lot there’s a sign advertising the Val Cote Musée Des Pierres, a rock museum. Sadly not open at 8.45 AM on a long-weekend Friday. 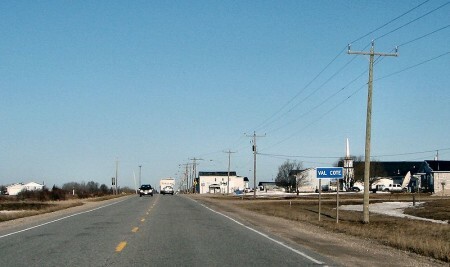 This entry was posted in The Interior and tagged dot on the map, francophone by Highway11.ca Editor. Bookmark the permalink. Born and raised in Hearst, I live in Kanata,now the west end of Ottawa. Recently we had bathroom renovations completed by a very reputable company. 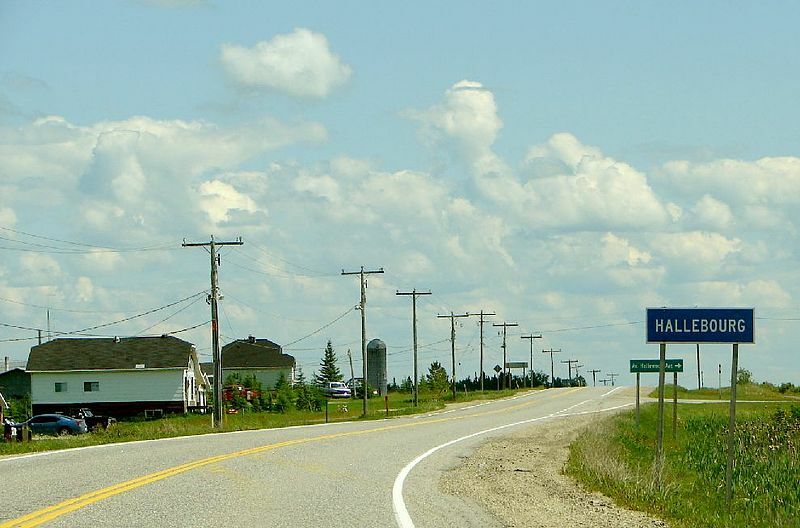 The 2carpenters/plumbers/electricians that arrived started talking about a son living in Val Cote….they were born in the hospital in Hearst but were raised in Mattice where their mother ran the general store. Small world. They did an excellent job. Quality people born and raised in Northern Ontario! My brother Ted and I always stopped in at this store to buy chocolate bars and chips upon returning from our fishing trips on the Mighty Missinabi River. By then we were tired of eating pickerel. The store had a pleasant odor of candy and groceries. Ted and I were twins. Unfortunately he passed away about 11 years ago. We never had spending money, so during our lunch hour at Hearst Public School ( now Clayton Brown Public School) we would comb the back alleys in Hearst looking for pop and beer bottles, bring them over to Alfred Smiths Confectionery. He paid two cents a bottle and we would stock up on candy. Hi Mike, thanks for the kind comments. Glad you enjoyed the site. I have pictures of the inside and outside of the rock museum. It is a fantastic place to go! So many incredible rocks and Romeo and Therese have some very interesting stories. I would like to share these photos! I encourage everyone in the area to take their visitors there to visit the museum! So educational too for the children! Thanks, Les, for posting this! Summers are hard on moms who want to write, never mind kepineg up a blog. That infographic cracks me up! Here’s to all the struggling writers who are trying to focus and write brilliantly. Hats to you, and hugs. just to let you know that the church is no longer there, it was torn down, and there has never been a caisse in val-cote. This is a history outline of Murielle (Smith) Hughes of North Bay who was requested to do this for Lorne Fleece. Hallebourg I will never forget that place. Good and bad memories. In 1950 my parents Alfred Smith and Rose Chabot decided to move from Montreal to Hallebourg to take over my Grandfather “Edouard Chabot” General store. We travelled by car. I was five years old at the time. The business had a Post Office, a gas station and everytthing a person needed to purchase.We worked very hard and long hours. The population was about 300 t0 400 people, all large families, 12 to 18 kids.They owned farms and the young people worked in the bush.Most people had a car or truck and the train went by ever day and would stop in the village to pick up people. The train was very reliable then. My sister and I would collect the mail bag from the train and bring it home on a sled . Hallebourg had a nice church named L’Eglise Saint Ann which was the patron saint of Hallebourg.Every year on the 26 of July there was a big celebration in honour of St. Ann. People came from all over,to celebrate pray and sing. It was important. It is still done to-day.The priest then were Fahers Leo D’auteuil, Mathieu Quellette and Gregoire Dufosses. Education was poor at first,but on the arrival of the Sisters of Assumption everything changed. Lots of kids received an excellent education and became very successful. I must say my father spoke English and French very well,he was perfectly bilingual so helped out people alot with paper work, translation,he also was the Justice of the Peace. My mother looked after the business during the day, my father had a full time job for the Department of Highways, on top of our business. in 1966 and this is were we met the Fleece Family. My grandparents were Prosper & Emma Desgroseilliers who lived in Hallebourg in the 1920 s. They had the store and post office there. Prosper passed away in 1925 and is buried in the small cemetery at the church there. After his death my grandmother took over as postmistress until I believe 1933 or so. She remarried one Arthur Martin in 1929. If anyone can provide me with any photos or info about those days I would appreciate it.